In all the talk surrounding the GDPR and what businesses need to do to comply, you’ve no doubt heard the words “data mapping” brought up time and time again. But what exactly is data mapping? And why is it so critically linked to the GDPR? We’ll walk you through the definition of data mapping and why it matters for GDPR compliance, along with some helpful examples and resources, so you can create a data map for your business. 1. What is Data Mapping? Data mapping is a system of cataloguing what data you collect, how it’s used, where it’s stored, and how it travels throughout your organization and beyond. There are various ways to achieve this goal – whether through a simple spreadsheet or a dedicated data mapping program – and the extent or limit of your data mapping will depend on your business. Data mapping is a combination of your data inventory and your data flow. In the CloudNine example below, you can see that their data map comes in two parts – a spreadsheet detailing the data they collect, and a flow chart depicting the movement of that data through internal systems and external transfers. Effective data maps require the input of nearly every department, especially IT, legal, marketing, and HR departments. Furthermore, documenting every bit of data should be closely supervised by either your data protection officer (DPO), or a senior member of your privacy team. Lastly, data mapping is not a one-time activity. While it should be carried out as soon as possible – especially if you’re subject to comply with the GDPR – data mapping is an ongoing activity that should be implemented into your regular business practices. The GDPR is all about updating existing systems and implementing new ones to ensure the safekeeping and fair treatment of the user data you handle. But in order to properly assess data security, you must first be able to track a piece of data from the point of collection to its eventual deletion. Without a bird’s eye view of the entire lifecycle of your data, any security measures you implement will be piecemeal at best. Not only is data mapping an essential foundation for carrying out the overall aims of the GDPR, but it’s also directly mandated by multiple articles of the regulation. Essentially, this article of the regulation is mandating that businesses map their data, and make those records available to supervisory bodies upon request. Under Article 35 of the GDPR, if you process data using new technologies, or in a way that potentially puts consumer rights and data at risk, you’re required to perform a data protection impact assessment (DPIA). When performing your DPIA, don’t forget to consult your data protection office (DPO). …a process designed to help you systematically analyse, identify and minimise the data protection risks of a project or plan. Steps #2 and #3 of this DPIA plan are directly related to data mapping. Step #2 is, itself, data mapping, while Step #3 – identify privacy and related risks – is an essential component of creating a useful data map. In the event that you need to carry out a DPIA, having these critical steps already accomplished from your data mapping efforts will simplify and hasten the process for you or your DPO. The fundamental goal of the GDPR is to protect user data by establishing stricter guidelines for the collection and handling of personal information. In Article 5 of the GDPR, the regulation establishes the key principles of data processing, as should be followed by businesses in order to meet this end goal. Among these principles is the idea of Privacy by Design (PbD). This is the concept that data protection and privacy measures should be built into every element of your business – as an essential building block, rather than an afterthought. To learn more about PbD and how to best execute it, read our comprehensive guide to Privacy by Design. Accounting for your data, and scouring your processes for weak points through data mapping, are key steps to implementing PbD and ensuring the safekeeping of user data. When constructing your data map, you should note the purposes for which you collect or process data, along with the legal justification for those activities. For example, if you collect email addresses from users who sign up to receive newsletters, you can log that category of data along with the note that it’s done on the basis of user consent. Sifting through your data and determining which basis applies to each of your processing activities will ensure that you aren’t inadvertently collecting or handling data unlawfully. This can both protect you in the event of a privacy inquest, and help you achieve the next GDPR compliance task on our list. Article 12 of the GDPR establishes the requirement that businesses present their users with clear and comprehensive privacy policies (also referred to as privacy notices). These policies should thoroughly detail your interactions with user data, including what you collect, why you collect it, how it’s stored, where it may be transferred, and other details concerning the collection and movement of users’ personal information. These are all components of the GDPR’s mission to grant users more control over their data. In order for businesses to comply with this section of the regulation, they must allow users a way to exercise these rights. The most common means of doing so is by offering users a Data Subject Access Request (DSAR) form. 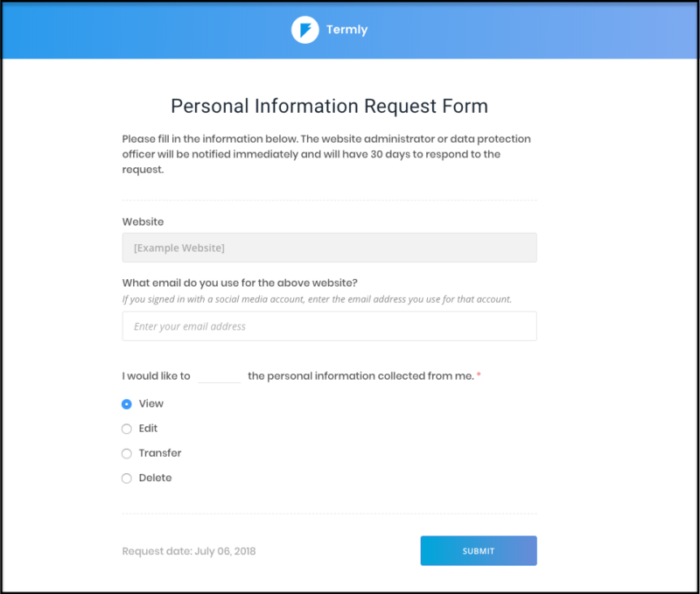 This is a popup or page that gives users the ability to request to access, edit, transfer, or delete their personal data. Offering users a DSAR form where they can exercise their user rights is one thing – but your job isn’t done until the requests have been addressed. Organization is made all the more essential in the event of DSAR submissions as the GDPR stipulates a one month time limit in which businesses must respond to these requests. Without an easily accessible, well-organized record of the data collected and processed for each user, along with the reasoning behind each processing activity, responding to each DSAR can be time consuming and costly. This is where a data map can help alleviate the burden of having to hunt for all the data collected from a user. Taking the appropriate action in the event that a DSAR comes your way will be made quick and easy is you’ve already mapped your data and can easily access the required information and accompanying details. There is no one-size-fits-all format or process for data mapping. In fact, they can come in all different forms, through different means of execution, and in a wide range of sizes and depth. What your data map looks like will depend largely on your data processing activities, and your budget. If your business collects, processes, or shares a lot of data, you may want to invest in a software program dedicated to data mapping. Through data mapping software, you’ll likely be working with a dashboard, through which you can navigate to your data inventory, flow chart, location details, and analytics. Some CRM solutions boast data mapping functionality, so you may be able to knock out two birds with one stone by choosing the right CRM for your business. If you’d prefer to create your own data map outside of a dedicated software service, you’ll most likely end up with a doc, spreadsheet, or map (or all three) detailing your data handling. The above style of map can be accomplished in either a doc or a spreadsheet, and is ideal for companies that don’t collect, process, or transfer large amounts of data – as this solution requires all manual input and is not highly-detailed. For more involved data activities, creating an interactive Excel map is a good option. This is a scalable solution that still requires manual input, but allows you more avenues for tracking and visualizing data processes. These are just a few of the many examples of what a data map can look like. Yours may be any one of these – or any combination of these. The important part of data mapping is that the end result contains all the necessary information about your data processing activities. When it comes to data mapping, there are both free and paid resources available online. Isle of Man Information Commissioner – Here you’ll find some helpful guides on data mapping, along with printable sheets that you can fill in with your business’s corresponding information. UK Information Commissioner’s Office – The ICO offers a detailed guide, including checklists and downloadable documentation templates for both data processors and data controllers. IAPP Data Mapping Tool – While this resource is technically free, you need to be an IAPP member to access it. IT Governance Data Mapping Green Paper – Here you can find a free green paper about data mapping, or access one of their paid data mapping tools. Astera Data Mapping Whitepaper – In exchange for your contact details, you can download a free whitepaper about the ins and outs of data mapping from Astera. Pinterest – It may not be the first place you think to look, but Pinterest actually hosts a variety of free data flow templates, checklists, spreadsheets, and infographics. In the past year, the world has been feeling the effects of the GDPR and the changing privacy standards that have followed. Complying with the massive regulation may seem like an unachievable goal, but addressing the GDPR piece-by-piece will help your business adjust to developing privacy standards and customer demands. One of the biggest steps you can take to accomplish this is to map your data. Not only is it a critical step toward GDPR compliance, but it’s also a good business practice. Understanding the intersection of data mapping and GDPR compliance, and taking advantage of the tools and resources above will ultimately help protect your users’ data – and your business.